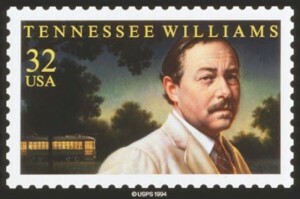 The Glass Menagerie, A Streetcar Named Desire, and Cat on a Hot Tin Roof are just three works by the Pulitzer prize recipient, Tennessee Williams. If you were to tally all of the ticket sales and lives affected from all levels of productions of his works, from local community theater to international hollywood starring cinematic masterpieces, and then consider the people involved from the audience, the ticket takers, the actors, the designers, the production teams, the moms, the dads, and everyone else that was personally involved, you would arrive at a ridiculously radical conclusion, it all started in one man’s mind. Like I said earlier this month, when your actions and person are a reflection of radically positive intent and behavior, they put your face on a stamp.